What is the Auto-Tuning Process on Temperature Controllers? Laboratory temperature controllers are used to regulate the output of heating elements to precisely control process conditions. Manual tuning allows operators to change the temperature with a dial connected to a resistive load; turning the dial to a higher indicator will raise the wattage and increase the temperature. This is a simple, if inelegant, solution for temperature control in laboratory environments. Many test parameters require tighter heating control than manual temperature controllers can provide. Precision temperature controllers have been engineered to overcome problems with over- or undershooting set-point temperatures. This requires an additional controller to perform auto-tuning of the load to significantly improve temperature accuracy. 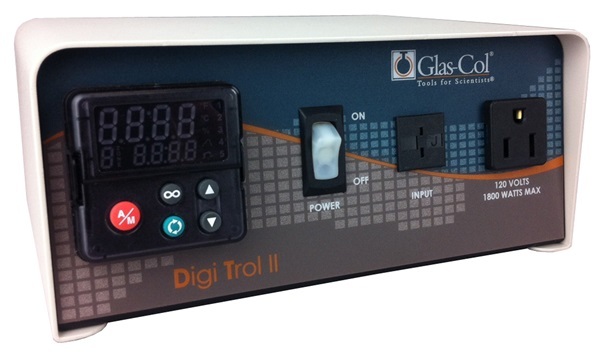 Glas-Col precision temperature controllers boast an accuracy of within 0.1% of the temperature span, generally within a single degree. But how is this auto-tuning process performed? Precision temperature controllers are generally equipped with a PID controller, which use a control loop feedback mechanism to control process variables such as heat oscillations. They continuously calculate an error value as the difference between measured heat and the setpoint as determined by the control system. This error value is then corrected based on proportional, integral, and derivative terms. The proportional control band is the area around the set-point value where the power supply is neither fully on nor fully off. It is generally expressed as a percentage of the controller’s full temperature scale. The integral time parameter, or the rate, determines the speed of corrective adjustments to the output signal used to compensate for differences between the set-point and equilibrium temperatures. Meanwhile, the derivative parameter, or rate, is used to calculate the rate of change and the thermal lag. Integral and derivative control parameters can be used to adjust the proportional control band to higher or lower temperatures. This three-mode controller facilitates the fastest response times for auto-tuning of temperature controllers. Precision controls are then able to display both the setpoint and the process temperature to provide the best temperature stability possible. Glas-Col is a world leader in the design and supply of process control instruments for laboratory applications. Our precision temperature controllers are extremely accurate, with an auto-tuning algorithm ensuring minimal operator intervention. If you would like to learn more about our temperature controllers, please do not hesitate to contact us directly.